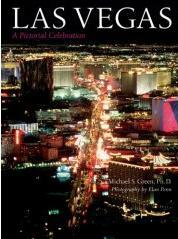 by Michael S. Green, Ph.D.
Las Vegas, one of the most fun places on earth, ever-changing, ever-challenging, ever-sparkling, never ceases to amaze people. Millions flock to this glittering gambling metropolis every day, some winning and some losing. Either way, the city is likely to make a lasting impression. This is another book in this series from Sterling, and this one is just as gorgeous as the others. There's an interesting history to this area, which is covered in this book, as well as the dramatic changes the city went through. There is also great coverage of the spectacular hotels along Las Vegas Boulevard and Downtown. Outside the city there is also plenty to see and do - more so than you'd imagine. When planning a trip to this desert, be sure to allow some extra time to see things like Red Rock Canyon, Hoover Dam, cute little Boulder City, the museums, and of course, the Grand Canyon. People tend to forget that Las Vegas is home to many hundreds of thousands of people. What a playground to have in your backyard. I love Las Vegas and I think I could live at the Belagio - it's so beautiful. Other books in this series include Chicago, Vancouver, San Francisco, and Los Angeles. Conclusion - These are beautiful books to collect.